Q Acoustics to launch Q-TV2 speaker system on July 24th | What Hi-Fi? This afternoon we've had confirmation from distributor Armour Home Electronics that the Q-TV2 will make its official debut at a press launch on July 24th. Billed as "probably the most important upgrade to televisions since the introduction of high-definition pictures or DVD" – no hyperbole there, then – the Q-TV2 is a clip-on speaker system with two satellites and a subwoofer designed to boost the sound of today's flatscreen TVs. 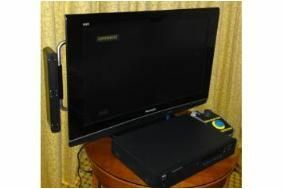 A flat panel containing the amplification and subwoofer clips on to the back of the TV, so it's hidden out of sight, and the two satellite speakers appear either side of the screen. It's designed as an instant 'plug-and-play' system for those who don't want the faff of a full surround sound system, but who find the sound quality of their flatscreen TV's built-in speakers inadequate. Our picture shows the engineering prototype we saw in Bristol. Hopefully we'll be able to show you images of the finished product on July 24th. Check out our original story for more details.